Before fans at the Theater at Madison Square Garden enjoy two light heavyweight championship bouts Sergey “Krusher” Kovalev and Igor Mikhalkin, and Dmitry Bivol vs. Sullivan Barrera” on Saturday, March 3, Main Events and Krusher Promotions presents the first title fight on the night’s undercard in the super welterweight division. 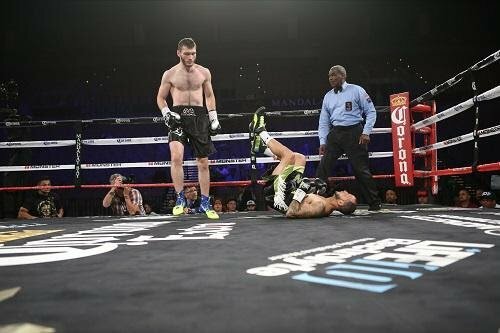 Murtazaliev, 25, has quickly made a name for himself since coming to the United States in 2016. He hopes to extend his seven-fight knockout streak and improve his already impressive 82% knockout ratio (9 KOs in 11 wins). This will be his third fight under both the Krusher Promotions’ and Main Events’ banners. Murtazaliev was able to return home to Russia for a holiday visit with family and friends, but then it was back to sunny Oxnard, California to train with Abror Tursunpulatov, who also trains two-time Light Heavyweight World Champion Sergey Kovalev. “In my preparation, my path is to do. Abror’s is to tell us what to do. Today, he tells us to throw rocks. Tomorrow, he may tell us to throw people. He has a plan … we trust him,” said Murtazaliev. There are a few big fans who won’t be watching the young super welterweight on March 3, though. “Nobody from my family has ever seen live video of my fights,” said Murtazaliev. “They are worried about me and they don’t want to see me get punched,” he laughed. Murtazaliev says only his father has ever watched him fight live, in Russia.